This super-lightweight 1/2 zip design is a must-have. this fleece for men is highly versatile as a pullover to stay warm during chilly autumn nights, as a light mid layer in spring and summer or paired with some classic Helly Hansen base layers in winter. This 1/2 zip design is warm, breathable and comfortable as a year-round companion for any outdoor, sailing or ski enthusiast. Founded in Norway in 1877, Helly Hansen continues to develop their apparel through a blend of Scandinavian design and insights drawn from living among some of the harshest environments on earth. The brand represents the optimal combination of performance, protection and style. 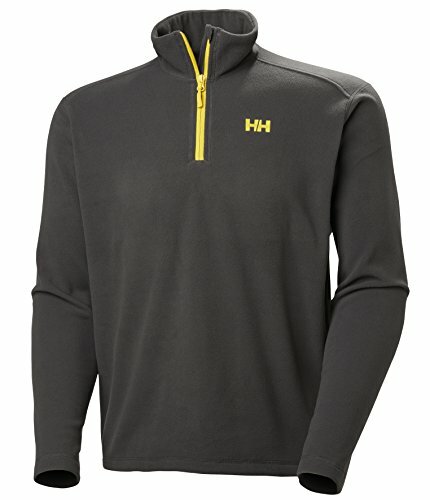 The company has a long list of first-to-market innovations including the first supple, waterproof fabrics more than 130 years ago, the first fleece fabrics in the 1960s, the first technical base layers made with Lifa stay dry technology in the 1970s and today's award winning and patented h2flow temperature regulating technology. Helly Hansen is the global leader in technical sailing apparel. its ski uniforms are worn by more than 50,000 professionals across 100+ski resorts and mountain guiding operations around the world, as well as national ski teams, Olympians and discerning outdoor enthusiasts. Technically engineered and real-world tested, all Helly Hansen garments are fully warranted against defects in materials and workmanship. Should any garment's key features or functions fail due to a manufacturing defect, we will repair it without charge or provide a replacement. all Helly Hansen technical outerwear garments (Helly tech, Helly tech xp and Helly tech O2) are covered by a limited lifetime warranty, this policy does not cover normal wear and tear on the product.